The primary workflow of many organizations goes through the Microsoft Office system. They use PowerPoint for presentations, Word for documents and reports, and Excel for data analysis and visualization. For some of these organizations, applying their branding styles and guidelines to their slides, reports, and graphs is typically a manual and extraordinarily tedious process. That’s I’ve teamed up with Jon Peltier from PeltierTech to create a new Excel add-in tool that will automatically apply your organization’s styles and guidelines to your visualizations. Before we describe how the tool works, let’s first define the problem we are trying to solve. For the most part, the Microsoft suite is a manual set of tools. Yes, you can use some coding to try to streamline certain processes, but for the most part, it is a manual toolset that requires the user to physically create something and move objects around within and between tools. You can create certain templates and themes, but they tend to be limited in scope and detail. Title in that specific font, left-aligned with the y-axis, bolded and at an 16pt size. A logo in the bottom-right part of every chart. Using the existing Theme menus, you can define the color palette and font so that every chart will use them. But what about the next three items on your list? 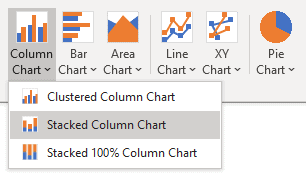 The default location for a chart title in Excel is centered over the chart in a 14pt size. You could create each chart and save it as a Template, but these templates are not very flexible. That’s where this new add-in comes in. What we have created is a new tab on the Excel ribbon that is integrated with the existing Excel charting menu and also applies your organization’s branded styles. Not only will your organization’s colors and fonts be applied correctly, but we can add a placeholder for a title in the exact location and size you want; logo in the right spot; a placeholder for Sources and Notes; different sizes for different purposes; and exporting options to save your charts in different formats such as pictures and for PowerPoint and Word. 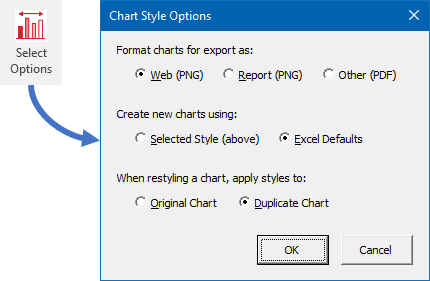 We have also created options that will allow you to create charts that are not in the standard Excel menu, including a Slope Chart and Dot Plot. We can also add other chart types, such as cycle plots and small multiples. All of this is built in the Visual Basic for Applications (VBA) programming language, which means it can be installed manually or pushed from a central IT department. And we can customize any of the features—want the title bold, 18pt, and right-aligned? Fine, we can set that up for you. Want your logo in the bottom-left corner? Yep, we can do that too. So instead of having people in your organization manually apply different styles, adding and moving around text boxes, copying and pasting between Office tools, we believe this add-in will streamline that entire process. It will make Excel charts look better, apply the styles more consistently, and, importantly, save people time (and frustration). At the moment, we are planning to sell customized versions to individuals, groups, and organizations. We can also help create a specific data visualization style guide, like the ones collected here, and then import those specific styles into the add-in. If you’re interested in learning more, please contact us and use the “Excel Add-In” in the drop-down menu. Hi Jon, great initiative with Jon Peltier!. I couldn´t locate the link to download the Add-in? Thanks! We are currently selling the add-in with customization options like font, color palette, and placement of different elements. If you’re interested, please email me directly using the Contact page and we can send you more materials. An add-in through which we can modify themes and templates for our charts without limitations. How would I go about making a Waterfall chart in PolicyWiz. In Excel 2016/O365, you can use the built-in chart engine to build a waterfall chart. 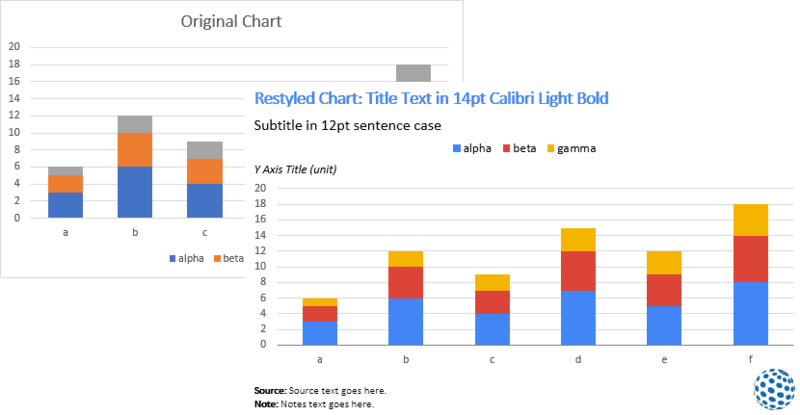 If you want more control over the formatting, you can build it from scratch following the directions in my ebooks: https://policyviz.com/product/a-guide-to-advanced-data-visualization-in-excel-2010-2016-combo-pack/.